Horizontal dial approximately 20 feet in diameter. The gnomon is stainless steel and the dial face is of ceramic tile. Has Hour markers for both standard and daylight saving time, and an Equation of Time table. Large panels also describe significant makers and inventions in Texas Instrument's history. Global map of the earth as viewed from the north pole. Inscription provides some sundial history. A vertical gnomon 19.58 feet tall projects its shadow onto a modernistic courtyard. The courtyard has inlays showing the hour corrected for the equation of time, give a sinuous set of curves to the hour lines. A granite and stainless steel equatorial dial approximately 6 feet high. Equation of time and user information are shown on a granite lab in front of the dial. This is an equatorial dial 3 x 4 feet tall, set up for the latitude and longitude of Galveston Texas. Corrections for the Equation of Time are cut as an analemma into the broad gnomon that rotates on a polar rod. The Equatorial time ring has hour lines viewed as standard time or DST at 5 minute intervals. The dial started when one of the Galveston residents constructed a park to honor his grand father. Bill Swann proposed to put a dial in one corner. His friend liked the idea. The park architect wanted the dial to be long lasting and suggested that it be made of galvanized steel. The dial is made out of rolled flat bar with a cross section of 3/4 x 4 inches. The dial itself was patterned after a dial which was located at Swann's college campus- Vanderbilt University. That dial was designed by the late Professor Dillard Jacobs. While Swann did not remember the specifics of that dial, the memory of it set the quest to decipher the suns orbit for this Galveston sundial. The time is displayed from a shadow cast onto a time ring. The "operator" pivots a plate, facing it toward the sun. The inscription on the plate reads "Face bar towards sun-Read time at month's shadow". The plate has a cutout in the shape of the analemma. Where the shadow cast by this cutout falls on the time ring specifies the time. Swann remembers that he "stayed out quite late one night to align the dial to a point in the sky near the north star." The sundial design is identical to the design of dial # 344 on the NASS web page. The metal forming techniques are different. Swann has been in contact with the designer, Peter Swanstrom. An 85 inch high bronze sundial-like sculpture with elevated horizontal semicircular ring and steeply inclined bar up from base. Pegs and marks on ring suggest hour marks but design is wrong for location. Work is dedicated to exploration of space and has been relocated to a very shady area. 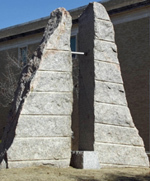 Monumental size sundial with a black granite gnomon shaped as a tetrahedral with a small silver ball nodus at the peak. 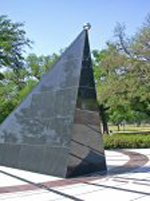 The 12 foot gnomon has a slope of 29.72 deg matching the latitude of Houston. The dial face is white granite with black granite stripes for hour lines, each marked by Roman numerals.granite stripes for hour lines. Along each hour line are markers for month pairs when the shadow of the nodus passes over. These markers are connected by thin declination lines, including the limits of summer and winter solstice and the straight line showing the equinox. A 72 inch painted steel armillary dial with meridian, equatorial, horizon, Arctic and Antarctic rings. Equatorial ring has hourly Roman numerals and zodiacal symbols on its exterior. 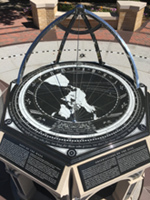 A bronze plaque on the base explains the armillary operation and provides a table of combined EOT and longitude corrections. Since Houston is more than 5 degrees from the time zone meridian, the longitude correction is almost 22 minutes, greater than the largest EOT correction, resulting in the combined corrections to always add to the dial time. Dial is mounted to a two foot diameter concrete pedestal. This dial was restored in 2000 by the Houston Municipal Art Commission funded by Searcy and Elizabeth Bracewell. This is a rare American stained glass sundial, accurately telling time and season. It occupies the center panel of a five panel window that forms a cross. 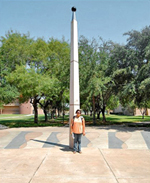 The vertical sundial panel measures 28x28 inches and declines 48° west of south, so it only functions in the afternoons. The dial is longitude corrected and indicates Daylight Saving Time when readings are adjusted using the Equation of Time. The gnomon is a 3/4 inch brass ball nodus attached by a non-polar axis rod to the aluminum Sussman window frame. It is the only stained glass sundial in the world that uses frosted colored stained glass to enhance the view of the nodus shadow. It has three seasonal date lines, a solar noon mark, and other marks showing special anniversary dates. It contains the traditional fly, seen on the the lower yellow panel between 1pm and 1:30pm. 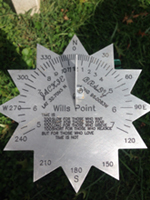 This starburst sundial is 6-3/4 inches in diameter, made of 1/8 inch aluminum plate. The dial is actually set in a 12-point compass rose, showing the azimuth every 30 degrees. Time marks are every 15 minutes with hours in Arabic numerals. All marking, latitude, longitude, and inscription are engraved into the dial plate.